This is a beautiful Kennedy half. Old green holder. Our grading is based upon what we think the coin would grade if sent to a premium grading service. We do not grade "sliders" as uncirculated, so don't buy an AU coin if it looks uncirculated in the pictures. These are Suitable for Third Party Grading. These Proofs are Suitable For Third Party Grading With Grades From PF64 to PF67 Being The General Range I Have Seen. They Could Grade Higher or Lower. This is the perfect way to add a First Year High Grade Kennedy Proof to your collection or give as a gift. My passion is US Minted Silver coins. NGC GRADED AS PROOF 69. SLABBED AND GRADED BY NGC. A NEAR FLAWLESS COIN. SLABBED AND GRADED BY NGC. AS CLOSE TO FLAWLESS AS YOU CAN GET IN THIS YEAR! Excludes: Alaska/Hawaii, US Protectorates, APO/FPO, P O Box. This is a great item to add to your collection. The item you see is the item you will receive. 1964 FIVE-COIN PROOF SET w/ RARE HEAVILY ACCENTED HAIR KENNEDY HALF DOLLAR . Shipped with USPS First Class Package. Proof 90% silver. Don't miss out on the chance to add this to your collection. 1964 Kennedy Proof. 90% SILVER. I DO NOT LIST COINS AT THIS PRICE WITH EVEN A PEPPER SIZED SPOT. IF YOU LOOK AT YOUR COIN COLLECTION CLOSELY THERE'S A GOOD CHANCE YOUR CURRENT 1964 PROOF KENNEDY WILL HAVE AT LEAST ONE BROWN MILK SPOT OR A SMALL BLACK PEPPER SPOT. Capitol City (Austin) Coin Club. Texas Numismatic Association. John Reich Collector Society #1367. ANA #R-3120942. Other Notes : Photo is actual coin you will receive. Occasionally I use file photos for lower valued slabbed coins. I feel my record and reputation speak for itself on this matter. Super nice for the grade. No worries! Over 100,000,000 served. 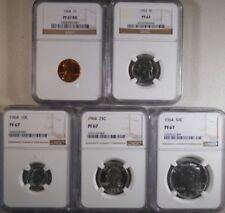 PCGS and NGC Authorized Dealers. We are human and do occasionally make errors, so we will make every effort to fix them. Price Varies Depending on Location and Weight. If you don't see it, ask us. No Exceptions. 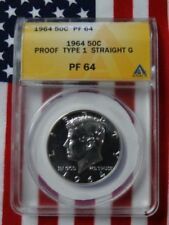 UP FOR SALE IS A SUPER NICE KENNEDY 90% SILVER GRADED BY NGC AS A PR 66. THIS COIN IS VERY NICE WITH OUT THE NORMAL WHITE SPOTS OR TARNISH. ALL IT TAKES IS TWO WAY COMMUNICATION. I DO MAKE MISTAKES, BUT WITH COMMUNICATION, PROBLEMS CAN BE RESOLVED ON YOUR SIDE AND MINE. We will do our best to share any information available. Over 100,000,000 served. More than just a pretty picture. We understand that coin grading is very subjective, so we highly encourage you to judge the grade of the coin for yourself with the pictures provided. 1965 40% silver SMS. 1966 40% silver SMS. 1967 40% silver SMS. 1964 through 1970 SILVER PROOF. 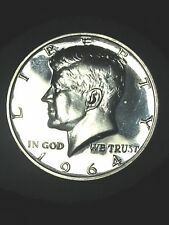 1964 90% silver Proof. 1970 40% silver PROOF. ICG GRADED AS PROOF 68. SLABBED AND GRADED BY ICG. A NEAR FLAWLESS COIN. 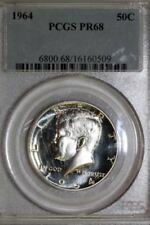 1964 KENNEDY SILVER HALF DOLLAR NGC PF-67 NO RESERVE! SUPER NICE! MUST SEE!! 1964 Kennedy Proof. Due to shadows this coin may appear to have doubling it does NOT. This coin is not a choice or gem it will have flaws and due to the mirror surfaces all blemishes may not be visible in pictures. The coins in the photo are not the exact coins that you will receive, they are however a good representation of what you will receive. The coins you will receive will look as good if not better than the ones in the images. 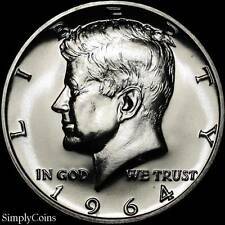 1964 Accented Hair Proof Kennedy Half Dollar 50C PCGS PR-67 NO RESERVE LOOK. Shipped with USPS First Class Package. FRESHLY GRADED FROM SET. PROOF KENNEDY HALF. The photo shown is of the actual item(s) you will receive. Believed to be only 40,000 to 120,000 of the accented hair variety minted, this coin is rare and in high demand. This coin will be a great addition to your collection. We try our best to include all details. What you see in photos is what you will get. Grading is very subjective, I will leave that up to you. We are also authorized dealers for the two major grading services NGC and PCGS. Love this coin! Don't Miss This One! NONE GRADED HIGHER! NGC GRADED AS PROOF 69 STAR TOP POP. SLABBED AND GRADED BY NGC. AS CLOSE TO FLAWLESS AS YOU CAN GET IN THIS YEAR! NGC CERTIFIED PF 68 CAM. The item in the photo is the item that you will receive. A blast white coin with no toning, milk spots, or scratches.